ჯეიმზ პატრიკ კევიზელი (ინგლ. 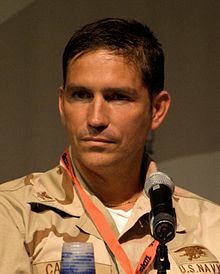 James Caviezel, ოფა [kəˈviːzəl]; დ. 26 ეკენია 1968, მაუნტ-ვერნონი, ვაშინგტონი, ააშ) — ამერიკალი არტისტი. ჯოხო მიპალუ თიშ უკული, მუთ ასახიერჷ იესო ქირსეშ სახე კინოფილმის „ქირსეშ გემრეფი“. 2008 ქუალეფით რაბადუა The Stoning of Soraya M.
↑ How to pronounce Caviezel — inogolo, How to pronounce Jim Caviezel in English — Forvo. თე ხასჷლაქ ეკონიას გეახალუ 18:19-ს, 28 ქირსეთუთა 2016-ის.